Honda's Electric Power Steering (EPS) system incorporates new ECU mapping for improved linearity in steering response, reduced low-speed steering effort for enhanced manoeuvrability and decreased kickback traits for improved all-around steering action. A selectable locking front differential has been added to the TRX500FM2's TraxLok® selectable 4WD drive system to further expand its off-road capabilities when the going gets tough. Maximum weight capacity has been increased to 250kg. 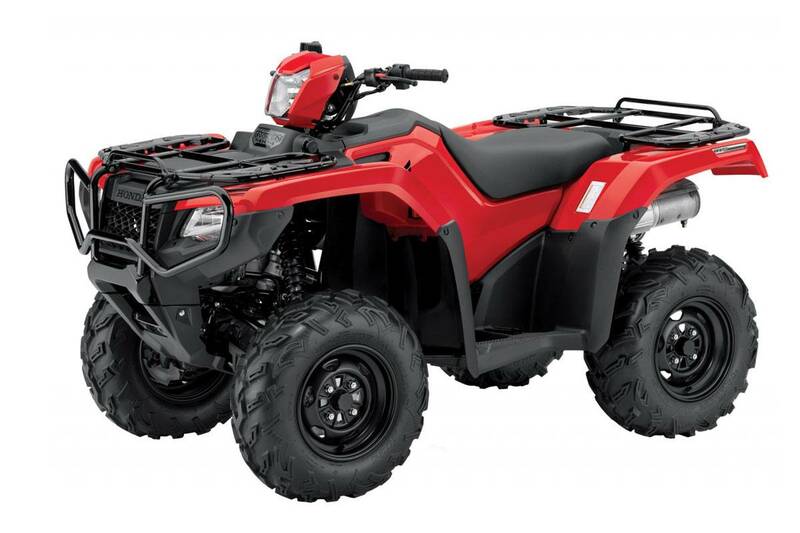 Powerful liquid-cooled 475cc singlecylinder OHV four-stroke engine is longitudinally mounted in the frame allowing direct driveshaft alignment to front and rear wheels for improved drivetrain efficiency. Revised mapping for the Electronic. Fuel Injection program gives the strong engine improved power delivery, throttle response and fuel efficiency. New fuel pump is derived from Honda automobile technology. It mounts in the fuel tank for better heat isolation and offers increased fuel filter life. The new TraxLok® system also features a Speed Override mode that can be engaged when the front differential is locked, this allows increased wheel speed under severe conditions such as deep mud. Overhead-valve design creates a compact engine for excellent ground clearance while maintaining a broad, easy-to-use powerband. A new chassis featuring longer-travel suspension elevates performance to a whole new level while a brand new enclosed axle swingarm has been developed to balance and optimise strength and rigidity, while improving rider comfort. New, aggressively styled bodywork provides improved mud and water protection and an all-new one-piece fuel tank/side cover panel allows easy access for maintenance. Revolutionary Electric Power Steering (EPS) with new three-point mounting setup for the EPS system makes the entire mechanism more rigid for even more precise steering. Honda's TRX500FM2 is formerly the TRX500FPM.